Liposuction is done with or without other cosmetic procedure e.g. Tummy –tuck, body lifts etc. Surgery involves a technique called Suction assisted Liposuction (SAL). Fat is sucked through a hollow tube that is introduced through small incisions. The incisions are closed at the end of the surgery. Surgery may take one to three hours depending on the areas of the body. Surgery is could be performed under local or general anaesthetic, depending on the patients preference, surgeons preference and the volume of the areas that require liposuction. All patients will have bruising and swelling with some discomfort to up to few weeks. Numbness around the area for weeks and months is normal. There would be scarring at the incision site but would fade over a period of time. 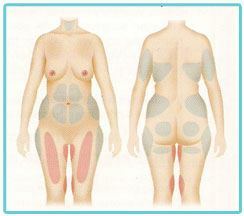 There may be uneven areas as fat settles and may require further surgery. There is a chance to return to theatre to control bleeding. General risks are Deep Vein thrombosis, pulmonary embolism and chest infection. Elastic vest or garment to be worn day and night. You can have shower. Gradually increase daily activities, walking may be uncomfortable if operations were on lower limbs. Should be able to return to work. Gradual return to normal daily activities, continue to wear pressure and support garment. Could remove pressure garment, bruising should settle. Swelling should resolve but some numbness could persist. If body weight is maintained you can see the final result.